This lesson is a very special one because it is the very first lesson that Miss Esther takes as Sunday School teacher. Emily and Robert Alexander volunteered to arrive early at church on the morning they were having a Sunday School lesson with Miss Esther. Miss Esther had asked them to help her put the tables and chairs out as well as making sure they put the crayons and pencils out too. Look at what has happened?! Instead of arriving early at church Emily and Robert Alexander spent time at the nearby pond instead. Georgie, Robert Alexander's dog, had chased some of the frogs out of the pond and even brought one into church in his mouth. If you look carefully you can see THREE frogs in the church. Emily has not been a good girl either. She had been asked to bring a jam jar to put some of the crayons in. Instead she couldn't resist catching some tadpoles that she saw in the pond. Look at Georgie. She looks SO pleased with herself having caught this frog in her mouth. She is showing off to Emily how clever she was to catch it! The two other frogs are enjoying jumping around the bell tower floor! It is no surprise is it that crayons have fallen on the floor here! In fact the two children have not done a good job at all in putting out all the things for the lesson. They have enjoyed chasing the frogs and Georgie around the church instead! Can you see where two of the frogs have gone? The children have been VERY naughty and put them on the font. 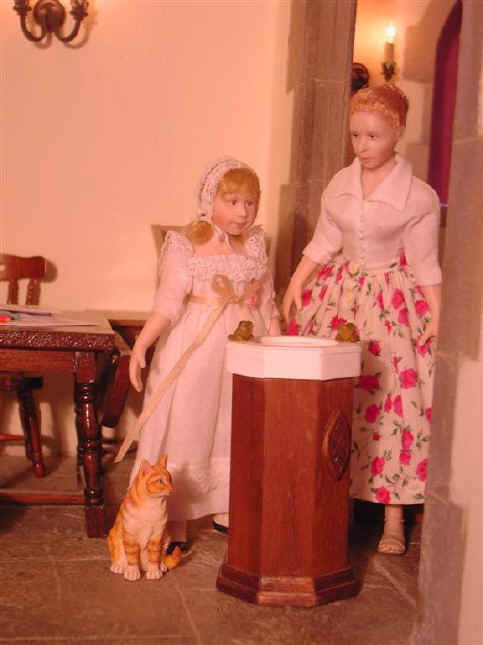 Emily and Robert Alexander remembered that when baby Clarissa was baptised the vicar put some water in the font. That made them think that it would be a REALLY great idea if the tadpoles made the font their new home along with the frogs!!! Emily was looking forward to tipping her tadpoles and water out of her jam jar into the font and watching them swimming around in it. 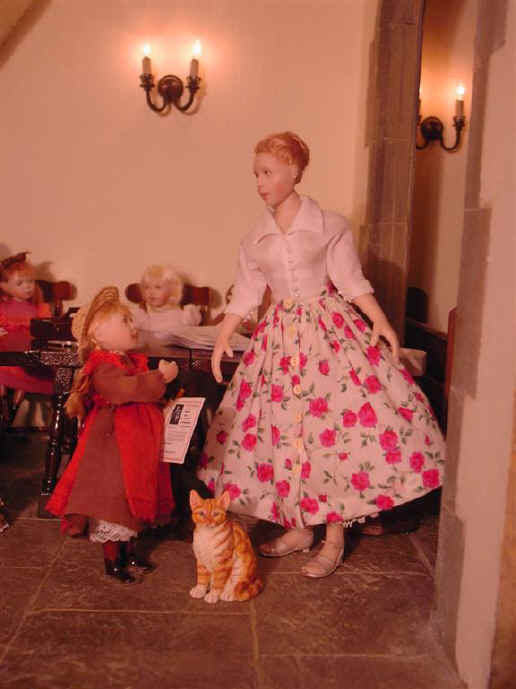 It is fortunate that Miss Esther, and Alice, who helps her with the children, have both found out in time isn't it? They both look really cross to find the frogs here! Miss Esther has made the children pick up the two naughty frogs off the font and has told them that they must take them AND the tadpoles back to the pond. She explained that the font was not a good place for tadpoles and frogs to live even though the vicar does put water in it when he is going to baptise someone! 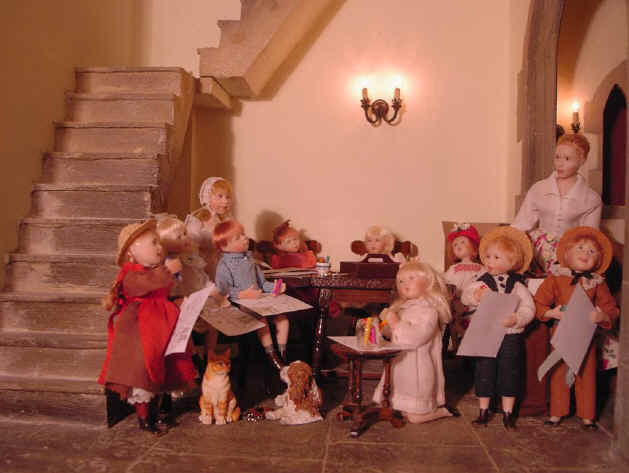 All the Sunday School children have now arrived for the lesson on the font! Everything is lovely and tidy now because Alice and Miss Esther had cleared up the mess that Emily and Robert Alexander had left when they took the frogs and tadpoles back to their proper home, the pond. Miss Esther was able to use the fact that the two children had brought the tadpoles and frogs into church to help further explain what baptism is to the children. She went on to explain that when we are baptised we become a "new" person, made perfect in the sight of God. That's just like the tadpoles become "new" creatures (frogs) when they finally come up out of the water! The children had been asked to bring in their baptism certificates. Adele was the first to run up to Miss Esther to show hers off! Adele had been baptised in this very font in St Hilary's when she was a tiny baby. She was SO young at the time that she had to tell her friends she could not remember it! However her parents and family often show her pictures of that happy day! All the children are now enjoying colouring in their font templates. When they finish them Miss Esther helps them cut them out and fold them because the font is a difficult one to make. Miss Esther was SO pleased with the font that Ben had made she said he could put in in the Sunday School miniature church! Here you can see he has placed it at the back of the church. Sometimes fonts are put at the back of church to remind people that it is by baptism they enter the church. The children really enjoyed their lesson on the font and look forward to the next lesson when Miss Esther has prepared it for them! 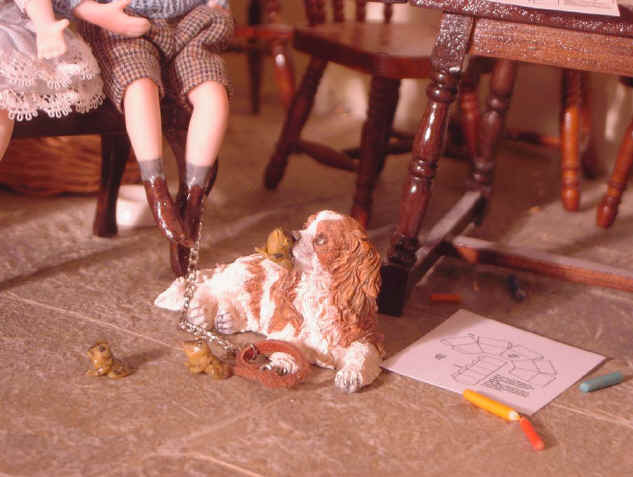 The frogs and tadpoles were made by Catherine Davies, my sister of www.dollshouseheaven.co.uk . The frogs were originally made to form part of a garden scene and pond inside a half of an ostritch egg. Catherine left them behind by accident one day when she brought the half finished egg to show me. She is most happy for them to appear on this page even though she is not 100% happy with them. 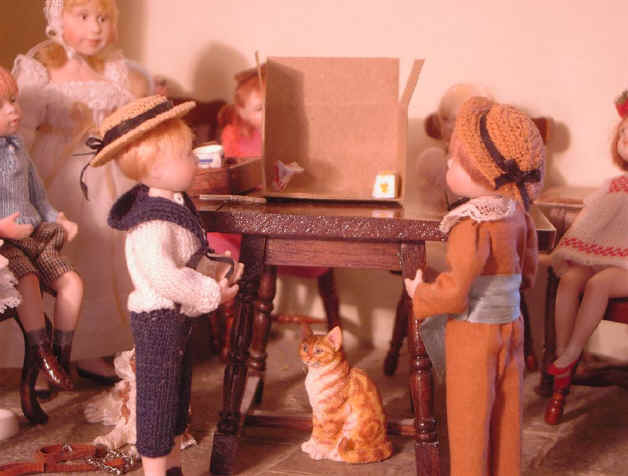 See Miss Lorna Webb's lesson plans for "A Miniature Church" for more details and templates etc. 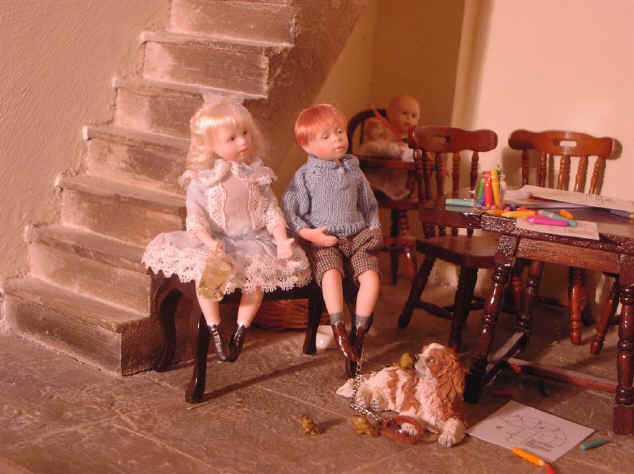 Sunday School teachers may consider using this page in conjunction with the lesson plans in order to enhance the children's interest in the lesson programme. Thanks also to Lorna Webb who pointed out to us the fact that tadpoles transforming from sea creatures with gills into land creatures, frogs with lungs, could be compared to the receiving of new life as a Christian through baptism. We have taken the liberty of lifting her text verbatum from the email in which she made the suggestion after seeing this page for the first time.